This guide takes you through the steps of creating a new site and setting it up for the first time. Before you start, be sure to review our Updates and Issues page for release updates and bug reports. Any SLS2 Webmaster or Senior District Webmaster for SLS2 can give you webmaster rights. When you have those rights, you will see a link to the Site Center in your toolbox at the top of the right column on your portal homepage. Senior District Webmaster can get to Site Center for any site via the Admin Center. 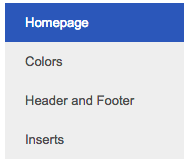 Click the Select Homepage button to proceed to a page where you can select a theme. You can change your homepage after you make your selection, however, please note that your home page content will be lost if you apply a new template. If you'd like to try out different templates, you should test different templates before adding a lot of content to the homepage. From the Site Center, select the homepage in the Site Map and click the Edit button. You are now in the editing mode for the homepage. To the left of the header, there's a menu with options to configure the color palette of your site, the header and footer, and the body of the homepage. You may configure these parts of your site in any order you like. Click Colors in the menu on the left, select a color scheme. You may change color as often and whenever you want. Click Header and Footer in the menu on the left. Your view will change to show only the header and footer at this point. Click Homepage in the menu on the left. Your view will change to show the entire homepage, though only the body of the page will be editable. It's easy to add new images to the carousel. Just drag and drop one or several images onto the carousel module. Learn more about working with the Carousel Module. If you prefer not to have a slideshow on your homepage, click the Carousel module once to select it then click the trash can icon on the toolbar. Congrats! You've completed the initial setup of your website, and you're now ready to start creating new pages and editing your content. When you've finished building your pages, you are ready to publish your site. You've built your site and you're now ready to publish - Awesome! From the Site Center, click the Tools tab and then click the Publish button. When you click the Publish button, your site is live immediately.